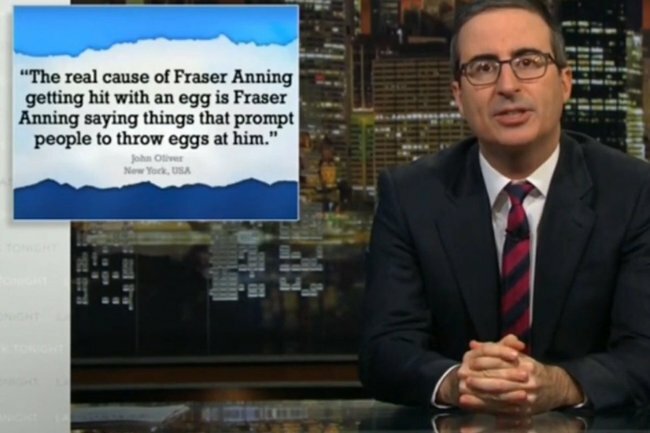 John Oliver just nailed how the world feels about egg boy. American late-night talk show host John Oliver loves to get stuck into Aussie politicians and their idiocy, so it’s no surprise that after an embarrassing few days, his most recent show focuses on Senator Fraser Anning. The comic didn’t hold back calling the former One Nation politician a “huge f***ing ***hole” for his comments in the wake of Christchurch’s terror attack. Oliver read out part of Anning’s controversial statement, which blamed the bloodshed in New Zealand on immigration. 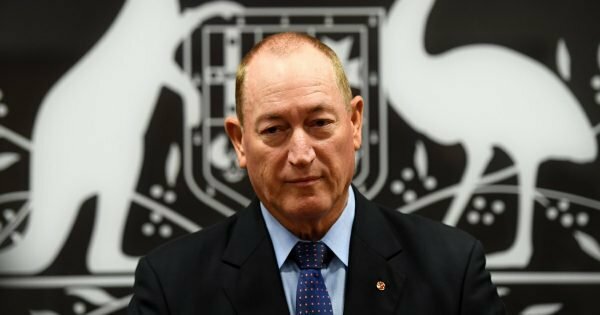 Fraser Anning’s concerning response to getting egged. Post continues after video. “Holy s—. That might be the worst possible response to what happened,” he said on his show Last Week Tonight, which attracts millions of viewers a week. The death toll for Friday’s terrorist attack currently sits at 50, with more than 30 still injured and many fighting for life, after a white supremacist gunned down worshippers in two mosques. The talk show host then showed the clip of egg boy, and Anning’s reaction, throwing his support behind the 17-year-old. His audience cheered when the clip was shown. “The real cause of Fraser Anning getting hit with an egg is Fraser Anning saying things that prompt people to throw eggs at him,” Oliver said. He was also quick to praise New Zealand Prime Minister Jacinda Ardern, while also joking about his love of making fun of New Zealand. “My point is, New Zealand is amazing, and it is showing its strength in how it’s been responding to this tragedy. The same, sadly, cannot be said for Australia’s Fraser Anning — a hard-line racist politician and melted candle of Ed Harris,” he said. Oliver loves to keep an eye on Aussie goings on, and relay it to his huge American audience. In February last year he had a go at Barnaby Joyce and his affair. He also targeted Joyce when he threatened to euthanize Johnny Depp and Amber Heard&apos;s pet dogs. It&apos;s not actually the first time he has responded to Anning&apos;s antics. Seven months ago, he slammed the politician&apos;s maiden speech. Anning has already been criticised widely across Australia with a number of our major talk shows, including The Project, condemning his behaviour. There is a petition to remove him from government signed by almost 1.3 million people, and counting.